Features: Simple square suitcase type Construction. Light weight, easy to carry. Designed for domestic Use. Four no. of aluminum Cooking pot with cooking capacity up to 5-6 persons. Cooking pots are coated with high thermal absorbing coating. Cooking tray made up of aluminum and powder coated. Export Quality workmanship. Glossy shining finish & attractive look. Best for unattended cooking as it does not require the frequent tracking. Ideal design for any region of the world. 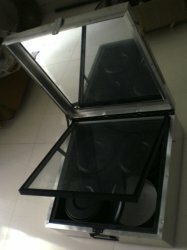 Lowest price compared to same capacity solar box cooker. Cooking at moderate temperature retains the taste and nutrition. Application: Cooking, backing and boiling of your favorite Veg recipe. It can also be used to dry the small quantity of grains and beans, Masala (spices), nuts and fruits for long and safe storing. Features: Features: Rectangular Construction along the East West axis. Designed for Commercial and industrial Use. Heavy and sturdy construction to withstand the heavy wind speed. Castor wheel arrangement for easy moving. 24/32 nos of aluminum Cooking pot with cooking capacity up to 50 persons. Cooking pots are coated with high thermal absorbing coating. Cooking tray made up of aluminum and powder coated. Trolley arrangement for loading and unloading of cooking pots. Top surface is inclined so that sunrays are always perpendicular to surface of the cooker. Export Quality workmanship. Powder coated GI sheet finish & attractive look. Best for unattended cooking as it does not require the frequent tracking. Its performance is better from simple solar box cooker. Ideal design for any region of the world. Cooking at moderate temperature retains the taste and nutrition. Application: This can be used for cooking in industrial canteen, hostels, hotels, restaurants, Ashram Shala, Dharam shala, Orphanage etc. commercial places. It can be used to Dry the beans, grains and nuts before Preserving. Features: Best for fast cooking. Parabolic Dish dia 1.4 mtr. Designed for Comercial and domestic Use. Heavy and sturdy construction to withstand the heavy wind speed. High quality reflective material. Castor wheel arrangement for easy moving. Capacity 15 people at time. Supplied with one no ISI certified 5 ltr capacity Pressure cooker. Bottom of the cooker coated with high thermal absorbing coating. Manual Tracking. Export Quality workmanship. Powder coated support structure attractive look. Its performance is better from simple solar box cooker. Ideal design for any region of the world. Cooking at higher temperature. Attention required. This can be easily done in solar oven. It can remove the moisture from food as well as any other material which needs to be backed or moisture must be removed from it before utilizing material. It covers lots of domestic, industrial as well as commercial applications. Suryapur solar energy has developed custom application based solar ovens. In the process of drying heat is necessary to evaporate moisture from the grain and a flow of air is needed to carry away the evaporated moisture. In solar dryer the heat source is solar energy. And the flow of air is generated either by natural convection or by forced convection. Solar dryer is also known as Solar Hot Air Generators. As per the construction of Solar dryer Suryapur solar energy has classified its Dryer models In following types. We also deal with of solar water heaters of branded companies. We have a best quality Solar water heater for quality conscious client and cost effective heater also available for economic class. We are a TEZUSOL energy based on surat deals in Solar Water Heater and Solar Cooker.